With the right hat (thank you Snail Creek Hat Co.), kimono (thanks @ofamuse ), cold medicine, custom hat feather from @flyingsrc ustomworks, jewelry, you too can feel like wonder woman. Off to see what kind of trouble … eh hum … I mean good … I can get into! 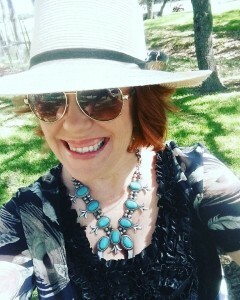 This entry was posted in Fashion and tagged jewelry, lifeonthehorizn, redhairdontcare, saturdayselfie, turquoise, turquoiseismysoulcolor. Bookmark the permalink.